The incredible, beautiful green of trees, grasses and rice against the blue rivers, blue skies and white clouds at the beginning of Buffalo Boy, seem like postcards of paradise. Bucolic scenes of water buffalo pulling ancient plows, sturdy peasants going about their generations-old toil. One imagines a tale unfolding of deep values, hard work, true love. Twenty minutes into the film this paradise begins to seem a picture of hell, not with fire but rain. Rain. Interminable rain. The ground is saturated. There is no possibility of plowing. There is little food for the buffalo. The family, in a thatched bamboo hut on stilts, on a hummock barely above the rising river, is impoverished. The father is sick. Buffalo herders come by, offering to take their two beasts on the annual drive to higher land where pasturage can be found. The father refuses: how will they pay? But soon they realize if their animals don’t get food, they will die, and with them, the family. So Kim, their only child, [The Lu Le] is sent off alone, with the only capital goods of the house, to try to catch the main herd, and plead to be taken on as a hand, in exchange for taking the buffalo to relative safety. The herders, led by Lap, an older man who knows Kim’s father, are a pretty tough bunch, as are the others they come in contact with — sort of a mix of our cowboys and outlaws in one group. Killing is not unknown to them, though incense and ceremony is offered if a animal dies. Kim gets his second lesson: dead animals must be skinned. The horns and hide are brought back to the owner as proof it wasn’t sold or stolen. Proof, as it were, of ruination. There are incredible scenes of herding by boat, or from the backs of the animals. Hours, it seems, are spent in knee and waist deep water. In some scenes the long-horns are swimming as the herders tug and slap them along, barely retaining a footing themselves. Kim’s two beasts are like horses in a western; he talks to them, anguishes over their hunger, naps on their backs. Other incredible scenes, apart from the buffalo, of oaring a small sampan down the wide flood-river, lost against the clouds and mountains. Many of the shots are from just above the water itself giving a sense of space and vastness across which float the tiny humans with their sorrows and troubles. Kim eventually teams up with another youngster, already the father of a five year old. The parents of the mother hate him, he says, because she is Viet and he is not. Kim becomes a favorite uncle to the boy, and shy beholder of the mother. The time period of most of the film, aside from the opening and closing, is meant to be the 1940s. There is no evidence of war, except against the water and the poverty. About two-thirds of the way through the movie, Kim is seen oaring his father down river, through the rain. The bamboo covering is leaking and crows are beginning to converge on the dying man. He attempts to give the boy his shirt, and asks if he can ever forgive him. “You do not share blood with your mother,” he says. “Your real mother died giving you birth. I raped her.” Kim thinks his father is raving as he dies. Not so. His mother was the sister of one of the other herders we have met, and not liked, in the film. Kim enlists the help of another river-bound couple to bury his father; the choice is to wrap the body and hang it from a tri-pod until the earth reappears, risking the crows and their hunger, or to drop it in the body weighted with something and hope to find it again after the floods recede to give it a proper burial. It is this choice which provide the opening and closing scenes of the film, and add the poignancy of years gone by. A fine, spare soundtrack of a small hand-drum and flutes adds to the environment. It feels native to what we are seeing and underlines without overwhelming us with a sense of place, and mood. The combined stories of man against the elements and men with other men is braided together effectively. You’ll be long left with images of the beautiful bare chested, very thin, Kim, of the green of the river plain, the white of the clouds. You’ll remember the crows, and the weight, the beautiful mother, Kim’s dying father. There aren’t many films coming out of Vietnam these days. The Scent of Green Papaya, The Lover, from Marguerite Duras‘ novel come to mind. The Owl and the Sparrow by Vietnamese American Stephane Gauger, came out in 2007. 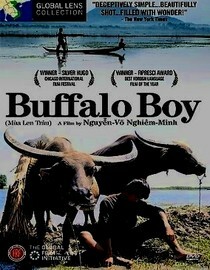 Buffalo Boy (2004, by Minh Nguyen-Vo) stands with a handful of other coming-of-age movies in its serious look at growing from hardship to hardship to old age, but told with a of matter-of-fact lyricism that is neither bathetic nor off-hand. For those of us whose chief knowledge and memory is of Vietnam as a war-ravaged victim of American troops and bombs, this will begin to add to its history, more formative in many ways even than 20 years of war. Buffalo Boy is also part of the Global Film Initiative — “Promoting Cross Cultural Understanding Through Film,” which I’ve spoken of before. Of that catalog I’ve seen Womens’ Prison from Iran [my review], The Kite, from Lebanon [my review] and Whisky from Uruguay as well as this one. They are all very innovative, low-budget and well executed, looks at the human condition — all in circumstances few of us are ever likely to encounter. They are all about 90 minutes in length. All are available for about $20 Netflix has 7 0f the 9 films in the 2002 catalog. You couldn’t do worse that work your way through their several years of film offereings. Both your filmic sense and range of story telling the human experience will grow.